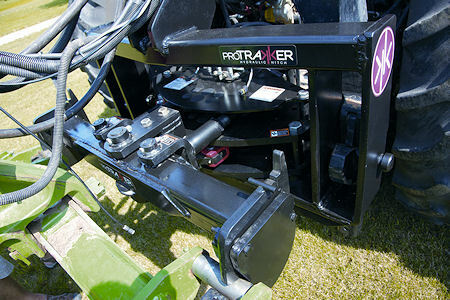 ProTrakker 400 DX designed for farm tractors up to 400 hp comes with two-point attachment. MBW's ProTrakker 400DX hydraulic hitch is a two-point attachment hydraulic hitch for farm tractors up to 400 horsepower. Like other ProTrakker models the new 400DX is designed to fit nearly any tractor. The unique benefit of the 400DX is its ability to transform from a 2-point hitch to a standard drawbar in just a few minutes. The "steering" available with the hydraulics helps growers avoid crop damage from tracking errors, helps eliminate overlap and improves repeatability in precision farming. EASY SWITCH: This hitch goes from two-point to drawbar quickly. MBW has launched a new Web site to show case its lineup and how all models are compatible with the leading GPS farm implement guidance systems on planters, strip-till machines and many other precision applications -- including John Deere iSteer and Trimble True Tracker. The ProTrakker 400DX also works without GPS if ordered with the automatic side hill sensor and control box. Visit the site at www.protrakker.com, or call (877) 568-4240 for more information.